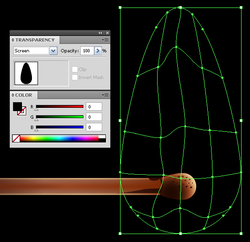 Tool and Screen Blending mode. Believe me, there’s nothing overly complicated. Please just follow the directions and take your time. This exercise is for anyone who wants to learn more about Blends. 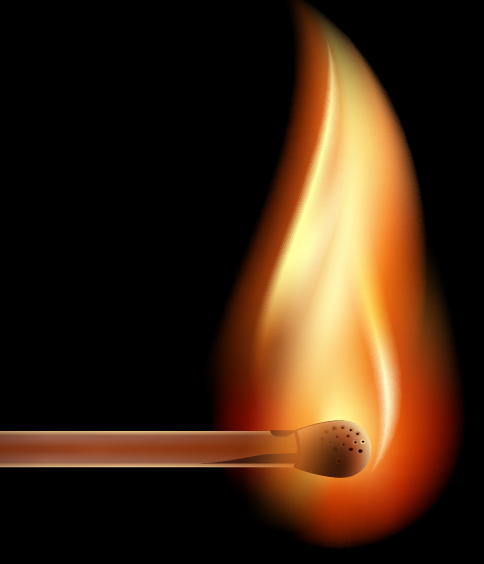 Look at that Match Fire - that's Vector Art - not a photograph. exercise with you as I want to learn how to use the Gradient Mesh tool. go to File > Document Color Mode > RGB Color. 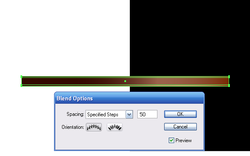 Begin the tutorial by creating a background. Use the Rectangle Tool (M) to create a rectangle filled with a black color. Click the picture at left to see a larger version. 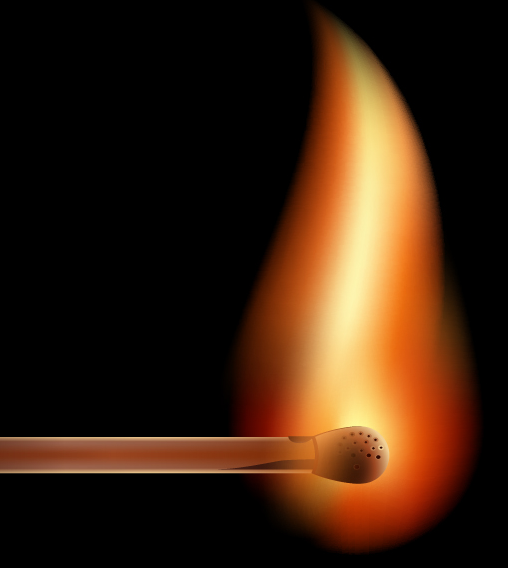 Take the Rectangle Tool (M) and create a rectangle in the shape of a matchstick. to convey the light distribution at the edges of the match. 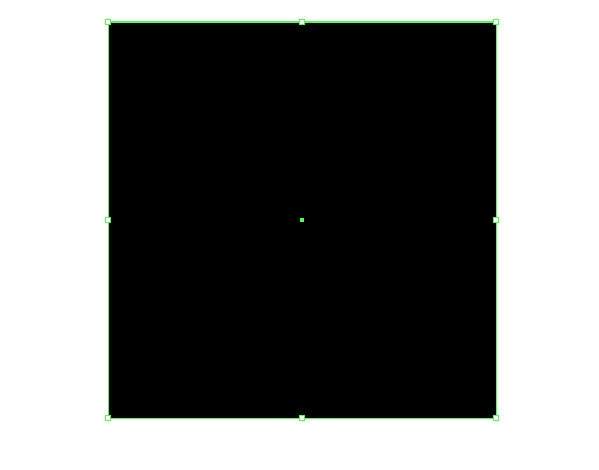 Next, copy this rectangle and paste it in front (Command + C; Command + F). 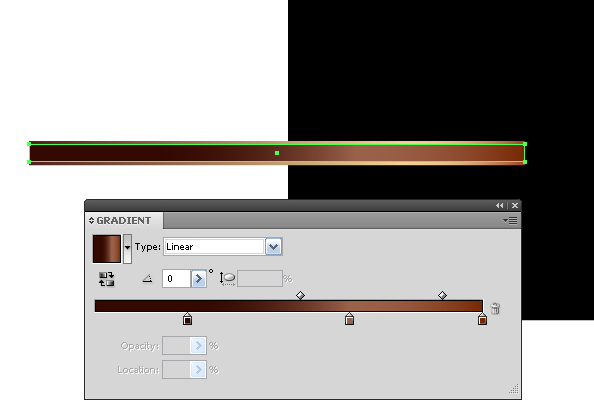 Now slightly reduce the height of the rectangle and fill it with a new linear gradient. The shades of brown on this rectangle are darker than the ones on the bottom rectangle. Look closely at the picture here. Click the picture at left to see it larger. Note there are 50 steps to this blend. 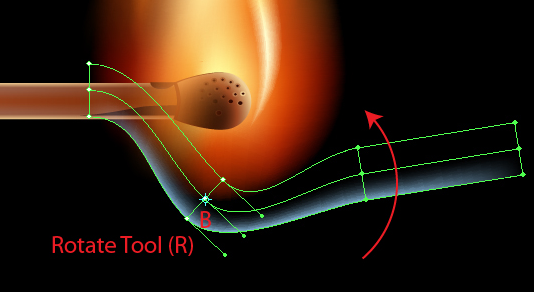 as shown in the figure at left, click the picture to enlarge it. 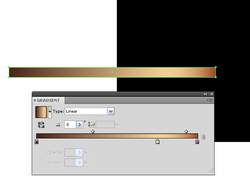 Set the Gradient fill and Opacity to 0% in the Transparency palette. Same width as the previous one but the Height is only 2 PIXELS! 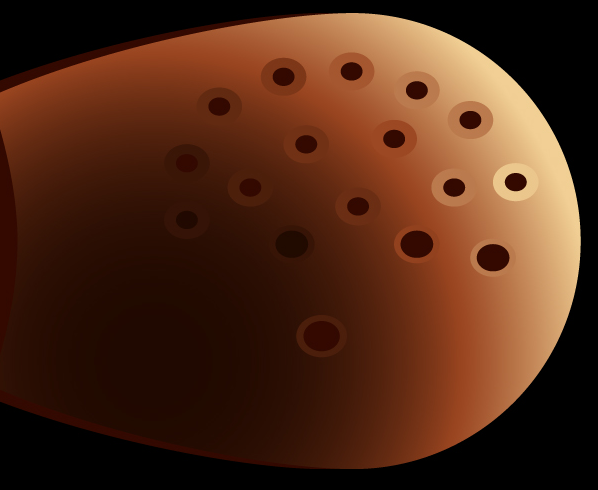 with the fill of the same gradient as a transparent rectangle. Hmmmm . . . sounds confusing . . . Move On if you don't get it! 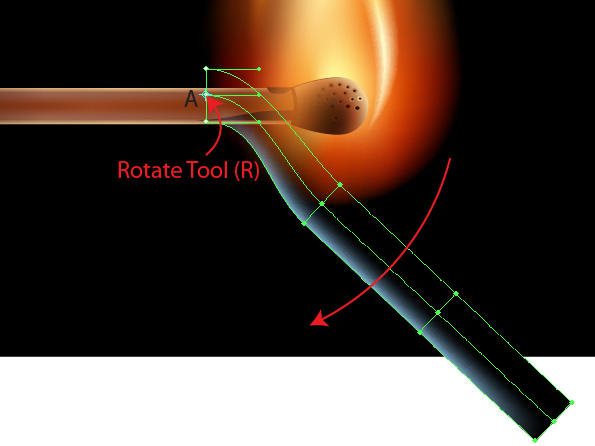 create a circle centered on the same axial line with the match. For convenience turn on the Smart Guides mode (Command + U). 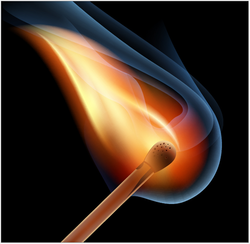 of the head and the matchstick (Top & Bottom). goes from dark brown to its light shades. 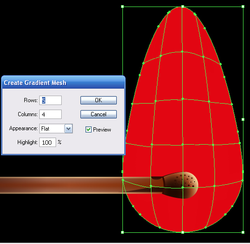 Copy and paste back the shape of the head (Command + C; Command + B). Fill the copy with a solid dark-brown color and shift it slightly to the left. 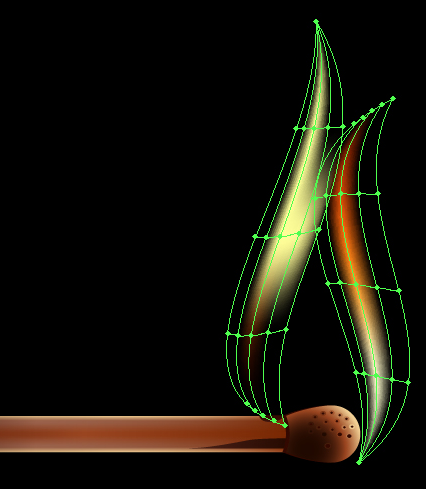 Take the Pen Tool (P) and create a place where the wood is burnt. These areas are filled with a linear gradient composed of dark shades of brown color. Click the picture at left to enlarge it. I see a few spots of dark brown color, not just on the bottom, but also on the top. In other words, this is all one layer so far, but we are "Sending to Back" in a few cases. 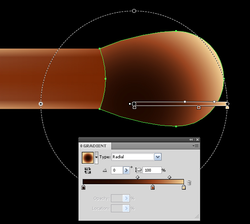 Take the Ellipse Tool (L) and create a small ellipse. 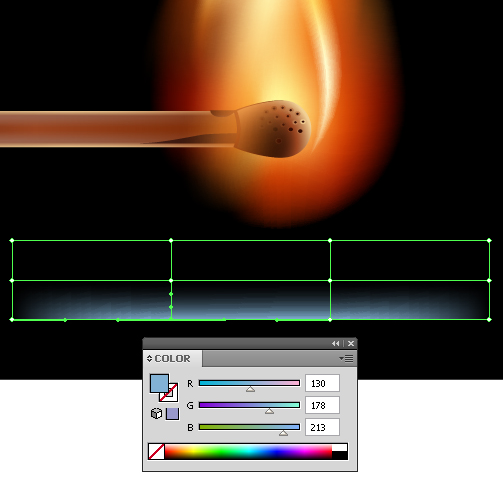 For the fill color, use solid color of the fill of a radial gradient of the match head. 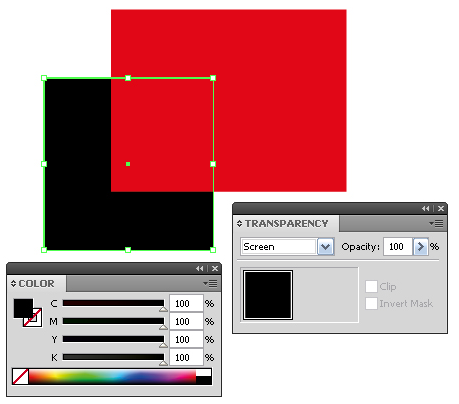 To take the color, use the Eyedropper Tool (I) and hold down the Shift to select. go to View > Hide Edges (Command + H). Use the same combination of keys to activate the selection. reduce the size and fill it with a solid dark brown. 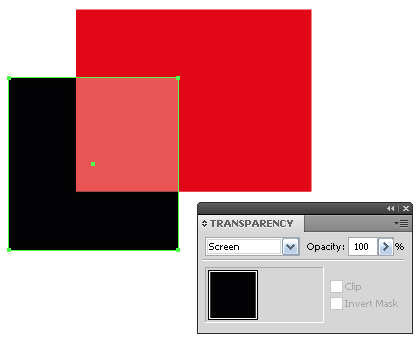 Screen Blending mode for them in the Transparency palette in RGB color mode. then in order to achieve this effect, you should use absolute black. 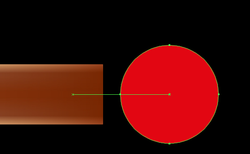 Use the Ellipse Tool (L) and create a circle. 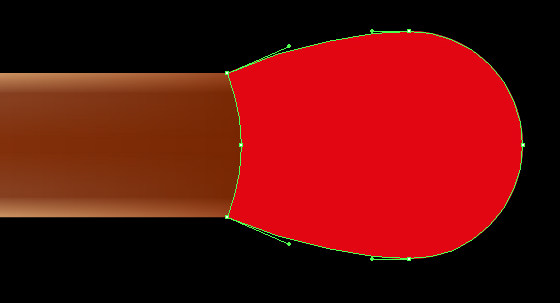 Using the Direct Selection Tool (A), pull the top anchor point up. below the elements of the match. Don't make a new layer - simply "send to back". STEP 10 • Making the Gradient Mesh Flame - Oh Boy! and set the number of rows and columns in the dialog box. Click the picture at left to enlarge and see the configuration. 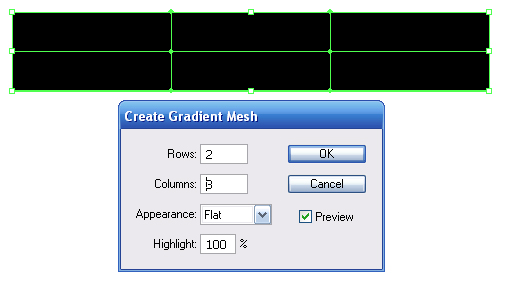 Remember that you can edit the grid lines that are obtained automatically. 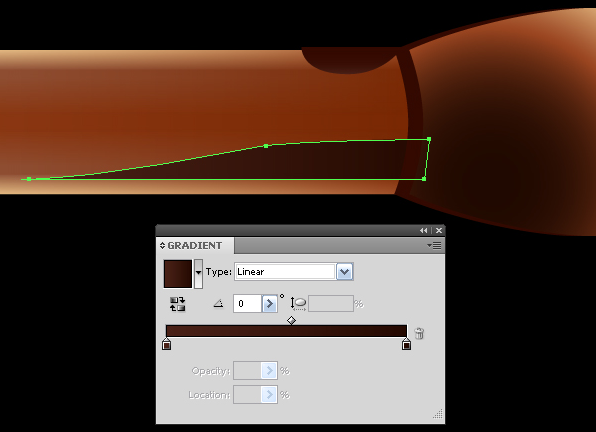 Use the Gradient Mesh Tool (U) to create new lines. Use the same tool to remove them but this time hold down the Alt (option for Mac). 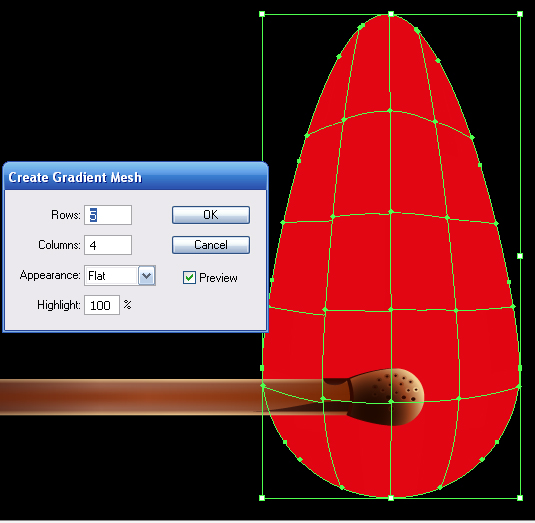 Use the Direct Selection Tool (A) for grid line distortion and movement of the nodes. in the picture at left. 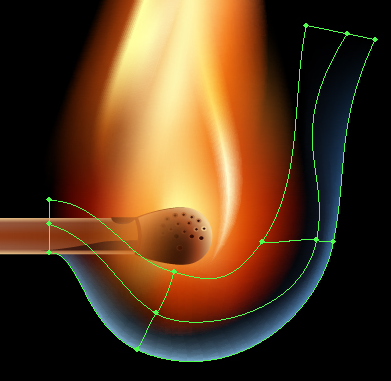 Flame is a movable object, so your grid can have a completely different shape. Layers palette and fill it with black. 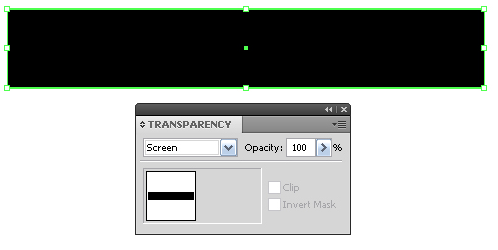 Set the Screen Blending Mode in the Transparency palette. Click the picture at left to see an enlarged view of the picture. Select the grid nodes and apply yellow and red colors to them. 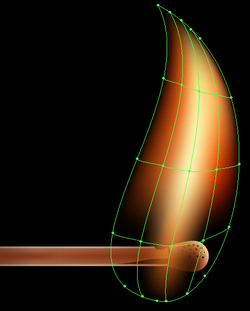 otherwise we get the sharp edges of the flame, which is unacceptable. 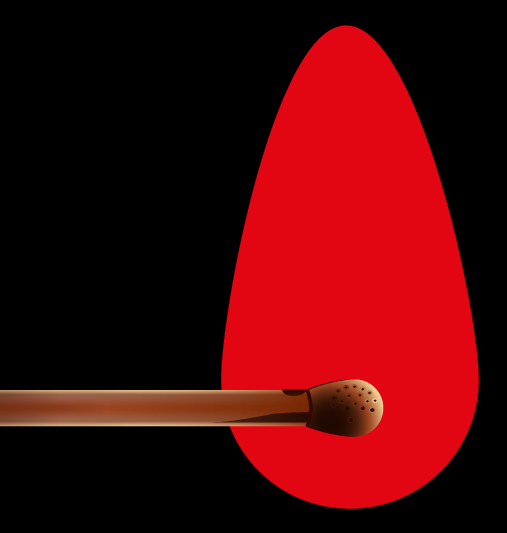 Create another object above the match. create a simple gradient mesh based on this object and color it. 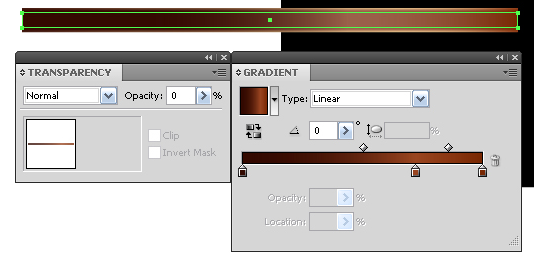 When coloring the gradient mesh you can use the colors of the already colored grids. In this, you can rely on your artistic taste to create a very interesting result. Take the Rectangle Tool (M) and create a rectangle filled with black. 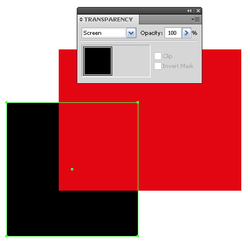 And set the Screen Blending Mode in the Transparency palette. and replace the color of the two bottom central points of the gradient mesh with blue. 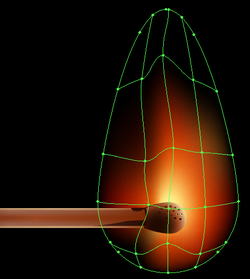 Now you need to bend the rectangle shape into the shape of a smoke stream. 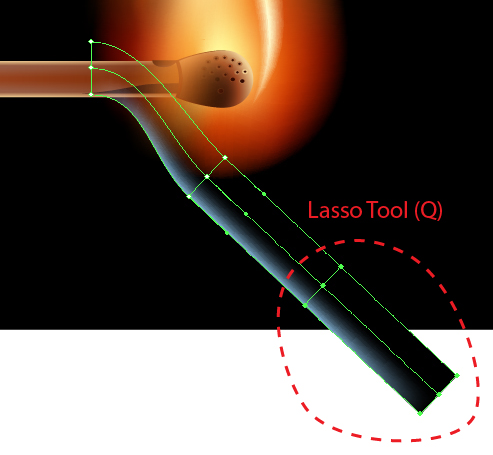 the Direct Selection Tool (A), Lasso Tool (Q), and Rotate Tool (R). Let’s take a look at the transformation technique. First, lock (Control 2) all the objects except the rectangle. 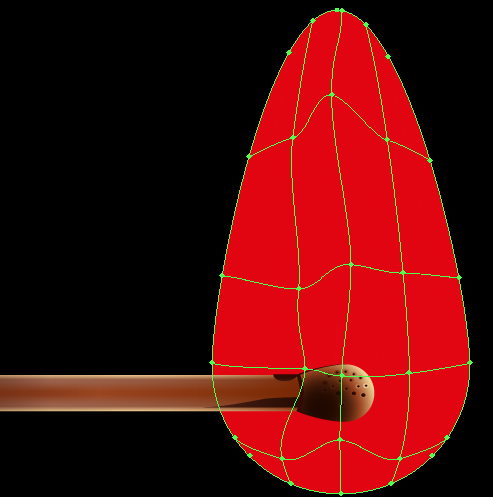 and select all the nodes of the grid, except those that are on the left side. In addition, you can move individual nodes and (or) several nodes using the Direct Selection Tool (A). Grid line operation is the same as with operating any other vector objects. I think you’ve got the working principle down. 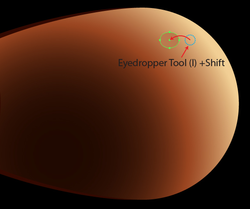 Bring the object to the view shown in the figure below.